Marvel’s Spider-Man: The Heist – Felicia Hardy aka Black Cat, is back in town and leaving mysterious clues around Marvel’s New York to toy with Spider-Man. Available for download 23 October 2018. 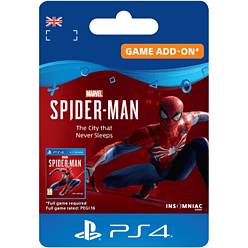 Marvel’s Spider-Man: Turf Wars – Spider-Man must put an end to the turf war erupting between the Maggia crime family and gang leader Hammerhead before Marvel’s New York becomes its greatest casualty. Available for download 20 November, 2018. Marvel’s Spider-Man: Silver Lining – Silver Sable is back to reclaim her stolen Sable International tech and gear from the city’s thugs – and Spider-Man must rely on unlikely allies to protect the city from calamity. Available for download 21 December, 2018. Explore even more of Manhattan and Marvel’s Spider-Man universe as a more experienced Peter Parker with the City that Never Sleeps DLC series. Includes three post-launch story chapters with new missions, new villains and characters, and additional suits for Spider-Man.